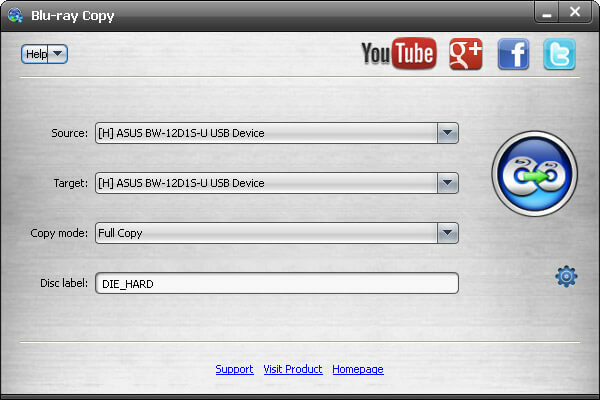 AnyMP4 Free Blu-ray Copy 1.0.8 無料ダウンロード - Copy any Blu-ray disc to Blu-ray disc, enable loading BD automatically. AnyMP4 Free Blu-ray Copy is an easy-to-use software, and it ows the professional and outstanding burning function, which can help you burn Blu-ray disc with any Blu-ray movie without any limitation, so you can download and use it freely. Thus you can share the burned Blu-ray movie with your friends and family. AnyMP4 Free Blu-ray Copy enables you to copy Blu-ray to Blu-ray, and burn Blu-ray disc with any Blu-ray movie with the ideal copy and burning speed and keeping the equal quality of the source Blu-ray. After you check this option, this Free Blu-ray Copy will load your Blu-ray Disc in the BD drive automatically when the application starts. When you copy Blu-ray, the program will automatically generate temporary files to save the information. And you can check the "Delete temp folder" option to delete temporary files automatically after finishing the copying process. you can also experience the latest research on this Blu-ray Copy with the auto-update feature. With the unique design and the newest technology, Anymp4 Free Blu-ray software is compatible with nearly all Blu-ray discs and brings you a lot of surprise and much more convenience.